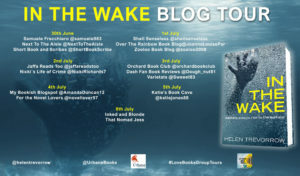 Welcome to my review stop on the tour for In the Wake by Helen Trevorrow. My thanks to Urbane for the review copy and to Kelly Lacey from Love Books Group Tours for the place on the tour. I liked the sound of In The Wake as soon as I read the blurb. A psychological thriller set around the media world sounded like something a little bit different. Kay Christie is the media link. She has her own PR company and is undertaking PR for the Excel centre in London and more specifically for a boat show. 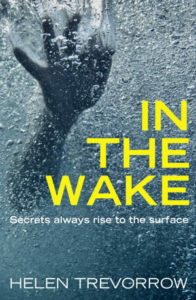 But a body is found in the water and when Kay catches a glimpse of the victim she realises she knows them, a fact that really scares her. There’s also another facet to the story, that of a missing French nurse, who we learn about right at the beginning. Where this strand comes into the storyline isn’t clear at first but becomes apparent later on. I did find the early parts of In The Wake a little difficult to get into. I don’t know why, I just couldn’t initially gel with the style and I found some of the dialogue a little awkward until I read on and got used to the writing. And I have to say that I think all the characters were unlikeable in varying degrees, selfish and sometimes downright unpleasant. But….before you start to think that I didn’t like this book, think again. I actually found it quite compelling reading, watching the characters press the self-destruct button over and over. There are numerous twists and turns, sometimes surprising, but not always, more like leading the reader down a winding path towards the truth. It’s hard-hitting in places with sexual attacks and alcohol playing a large part, and also the author doesn’t hold back when talking about the sexual activity in the book. It surprised me in many ways. The storyline didn’t go as I expected and the whole feel of the book was quite unusual. I found myself drawn back to it all the way through and thought it was a really good read.